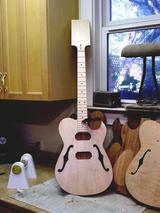 (6) Custom New design Semi-Hollow Electric C-Rocker Guitars in progress. Bodies have not been finished or pickups chosen as of May 18, 2010. If your interested in owning one of these classic designs, be sure and reserve your's now. A couple of new peghead designs I will be using on some of my new models. 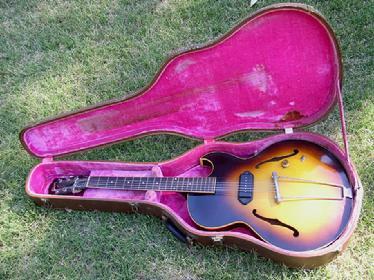 Since about 1965 while in high school, I always wanted a Gibson semi-hollow body guitar, however I couldn't afford it. You can only cut so many lawns. 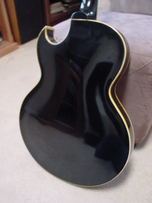 About ten years ago, I started looking at vintage guitars and found them to be even less affordable. 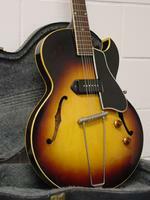 I then bid on a 1956 Gibson ES-225 with a broken peghead that was pretty beat up. I bought every book I could find on guitar repair; just about everything Dan Erlewine had written. There was a wealth of information and I took on the challenge. The restoration was a labor of love. 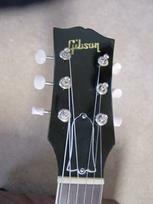 I finally got my Gibson. 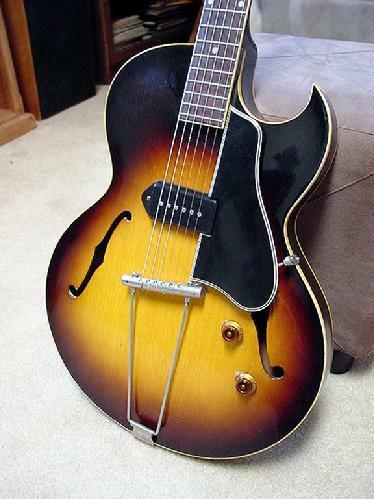 It turned out to be a great looking and playing guitar with that vintage sound that can only be expected from a single pole P-90 pickup. From there, as they say, the rest is history. 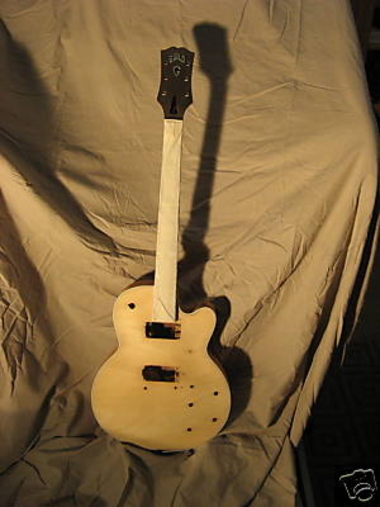 It's been about 14 years of repairing and restoring just about every type of guitar that came through my shop doors. 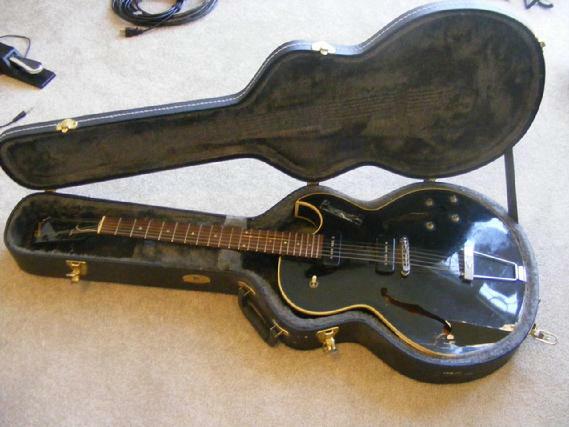 It was great satisfaction to return injured guitars to their former glory. E-mail and send me photos of your project and I will respond promptly with an estimate and time frame. 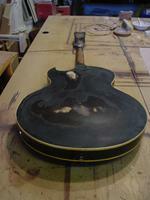 1956 Gibson ES-295 Project with broken Peghead & Missing Pickguard & Hardware. 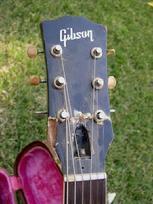 A collapsed case most likely cause headstock to break. 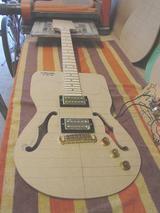 Completed project with Humbucking pickups, Hot Rod wiring and new Sunburst Finish. See the YouTube video on the Home Page. 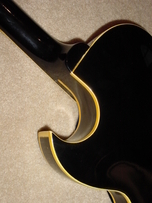 A Gibson ES135 that had both top, sides and back incur extensive damage. 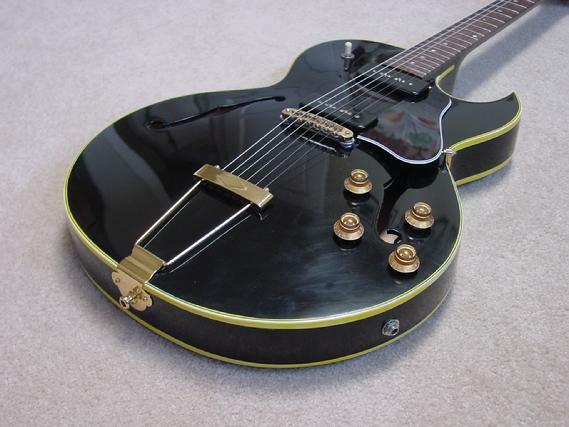 Completed project with all new binding, gold hardware, knobs and black lacquer finish.